Summary: Pushing back against the “hidden curriculum” of school writing as teacher-centered and reductive, Strong asserts a model of student-centered writing to learn. This article explains the importance of writing across disciplines and gives practical examples of authentic content area writing skills. 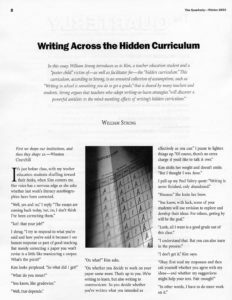 His 12-point description of the features of the “hidden curriculum” can serve as a powerful conversation starter with any group of teachers engaged in a study of school-based writing. It’s just before class, with my teacher education students shuffling toward their desks, when Kim corners me. Her voice has a nervous edge as she asks whether last week’s literacy autobiographies have been corrected. “Hmmm.” She knits her brow. “I don’t get it,” Kim says. “I really don’t get it,” she says again. Kim may seem like an extreme example of the teacher education student who doesn’t “get it” in lots of ways. But she (or he) does inhabit preservice and inservice classes all across the land, even those that use writing as a tool for learning—a means of making knowledge personal, connected, and accessible to self—as well as a tool for communicating with others. The point of my literacy autobiography assignment was to prompt reflection, but Kim didn’t like the idea that writing could make her an open book, one that others might read. She resisted writing-to-learn activities and had plenty of questions as we got into the actual drafting and revising work: How long does it have to be? Why write about your experience if you already know what it is? Do spelling and punctuation count? Why waste time in response groups? Yet, despite her foot-dragging, Kim could also be deference personified, the archetypal brown-noser. Laughing loudly at my lame jokes, she mouthed platitudes to deflect attention from her limited grasp of topics at hand. For these and other reasons, I had trouble picturing her as a knowledgeable and dynamic teacher, one I’d want working with my own children. I read her paper with interest. Aside from its technical flaws, the writing was detached and cool, describing with smugness how she’d eased through secondary schools without writing a single essay. Her strategy was to trade math skills for the writing talents of others. She’d dictate a few key points to friends, who’d do “the dirty work” that she’d recopy or download. When it came to reports and term papers, the issue for Kim was not so much ethics as efficacy, a division of labor. Through cunning, she suggested, it was easy to “beat the system.” Fakery made sense because it reduced the workload. “So who wrote this paper?” I asked in the margin, forcing a smile. Kim’s cynicism was a pebble in my shoe. She seemed to view all teachers (me included) as faceless functionaries in a long, weary line of grade dispensers—persons who held up hoops for her on-cue jumping. Also, she seemed to regard schooling as a game, the goal being to outwit those in positions of authority. Left unanswered was the question of why— given her core beliefs about the fraudulent nature of the enterprise—she’d even want to teach—or how she’d treat learners in her own classroom. In papers written by Kim’s colleagues, I was reminded that grades really matter. Some described being sacrificed on the bloodstained altar of grammatical correctness by insensitive, sadistic teachers. Others lamented how they hadn’t gotten top grades, despite having worked “really hard” on writing, even spending time in the library. I nodded sympathetically but began to wonder about grade inflation fueled by student expectations. Ironically, many of the student-as-victim complaints were compromised by stumbles in expression. To assist development, I gave advice on conventions and encouraged writers to smooth out the language before submitting a final draft. But Kim was unique in the richly detailed perversity of her attitudes. She saw efforts to invite personal meaning-making as “bogus.” She saw writing-to-learn activities as ways to keep kids in line, a kind of no-nonsense behavior management tool. She saw grades as “the whole point of school, the only reason students show up.” As I later heard her voice these ideas in my office, her expectations about teacher and student roles also became clear. The teacher’s task was simply to assign, correct, and grade writing; and the student’s job was to “psyche out” the teacher and write to specifications. She wanted me to lead in certain traditional ways so that she could follow in others. As I now work with teachers in the schools, I’m forced to conclude that Kim and students like her are products of a kind of hidden curriculum of writing, one that she had learned well and that many students act upon every day. This curriculum isn’t found in national standards, in state frameworks, or in colorful scope-and-sequence charts. Rather, it is a curriculum of outcomes, and it results from the way we use (or abuse) writing in middle schools and high schools. Ask yourself—or your students—whether these statements ring true. Writing in school is something you do to get a grade; school is something you do to get a diploma or certificate. The main purpose of writing in school is to tell the teacher what the teacher already knows, not to explore a topic or idea. A second main purpose of school writing is to provide diversionary busywork (or “time filler”) so that the class is occupied. A third main purpose of school writing is to serve as a management threat to students or as actual punishment for misbehavior. The central intellectual activity in school writing is to guess what the teacher wants, not to figure out what’s worth saying or how to say it most effectively. Information about required length is essential in school writing in order for you to pad appropriately or to minimize the possibility of doing extra work. Successful school writing takes no chances with ideas, thereby avoiding the risk of saying something interesting, important, or thought-provoking. Good school writing uses a stilted, objective, and artificial voice—preferably heavy with ponderous words and vague abstractions. The best school writing uses a safe, conventional approach (short sentences, formula paragraphs, and mindless banalities) so that errors are minimized. Any type of personal writing (or writing on which one claims to have worked hard) automatically deserves a high grade, regardless of its other features. Features of writing such as intelligence, quality of development, clarity, and logical support are merely the “subjective opinions” of the teacher. Feedback from the teacher (responses, suggestions, questions) are really corrections in disguise, and their purpose is to justify the grade. Of course, the official goals for writing are quite different from those above. We use jargon like “assessing comprehension” and “developing critical thinking” to explain instructional uses of writing. But despite our noble aims, the hidden curriculum of writing often gets taught in subtle and powerful ways—for example, when students are routinely assigned low-level worksheets, when objective exams are the assessments of choice, and when misbehaving students are given written reports as punishment. I want to be clear at the outset that my purpose in describing Kim is not to “blame the victim” as so often happens in discussions of classroom practice. Instead, I use this real case-in-point to ask why so many secondary teachers continue to view writing as a tool for testing and class control rather than as a means of learning. Let’s begin with the obvious. Some academic writing is a test, and skill in passing tests has great utility. The stakes are high—for students, teachers, and administrators—in today’s tense environment of performance standards. None of this is likely to change any time soon. Recognizing that students need to be savvy about essay exams, many of us teach to the test with the best of intentions, advising students to use five-paragraph formats. Of course, if we restrict writing to such scaffolds—and insist that students always “keep it simple”—we may also communicate a darker message: that form matters more than content and that school writing aims to prove to some dim-witted reader that one can make three perfunctory points framed by an introduction and conclusion. Further, if we’re honest with ourselves, we’ll probably confess that we too have been well-schooled in the hidden curriculum. As learners, haven’t we all asked the “what-do-you-want” question? Yes, there may be differences between our middle school geography report copied from an encyclopedia and Kim’s paper on capital punishment downloaded from the Internet for English 1A, but was either of us really writing to learn? How about the essay exam we wrote without doing the required reading? Or the patchwork of quotations that was dutifully submitted when a college paper came due? Indeed, Kim may remind us of ourselves not so long ago—reluctant to confront our ignorance and uncertain about our skills. Discovering ideas may be exciting, but it can also be intimidating. A hidden curriculum refers to messages that students read “between the lines.” Take grading practices. As in the past, most teachers use tests instrumentally—that is, as tools to motivate reading or to prompt the learning of skills and content. And many of us—though we won’t admit to it publicly—continue to use quizzes, tests, and other academic work to control or manage student behavior. For example, when students act out or become unruly, they may get extra homework or busywork (such as preparing a 500-word report or looking up definitions). The teacher couples an aversive aspect of schooling with the threat of a low grade to force misbehaving kids to “shape up.” After such lessons, we shouldn’t be surprised when learners develop bad attitudes toward writing or vocabulary learning. Students are not stupid, and punishing activities are ones they’ll long remember. In secondary school culture, and also in the culture at large, we think of grades as a given condition, a little like the air we breathe. Grades matter—whether we are students, teachers, parents, or coaches worried about player eligibility. Like Kim, we may act as if grades are “the whole point of school, the only reason students show up,” even as we disassociate ourselves from her cynical perspective. We may not be certain about what grades represent or whether they bear any connection to learning, but we still regard them as the mortar of Western civilization. The idea that all writing gets a grade—and that one writes mainly to get a grade—comes from our shared experience in school. We understand, as students, that learning requires risks, and that risks lead to mistakes, and that mistakes often result in low grades. So, we learn to play it safe. The grades that follow writing bring elation or anguish, relief or resentment, indifference or confusion. But these powerful emotions are tangential to our learning, which occurs—if it occurs at all—during writing. From this analysis, one conclusion seems inescapable—that grades often interfere with our efforts to use writing as a tool for learning. Why? Because learners focus on “psyching out the teacher” and “writing to specifications,” as Kim put it; and because teachers focus on grading the mountainous stacks of student work instead of merely sampling the texts for evidence of learning—feedback that might inform tomorrow’s instruction. Thus, our traditional ideas about grading deliver a double whammy to writing-to-learn activities. If the teacher is the sole audience—and if students view writing only in terms of grades—they’ll tend to adopt strategies of pleasing the teacher and playing it safe rather than exploring ideas, raising questions, and making personal connections. Moreover, if teachers see their job as grading all the scraps of writing produced by all classes—an onerous task, to be sure—they won’t assign any writing-to-learn activities. Here is Strong’s First Law: If the amount kids write is limited by what teachers have time to grade, there’s no way they’ll write enough to learn curriculum content. Clearly, the hidden curriculum of writing shapes behavior. For Kim, it meant a single-minded fixation on grades and an unwillingness (or inability) to think on her own. Because she had never used a journal or learning log to think about subject matter, her reasoning skills were impoverished; and because she’d never written for purposes other than a grade, her strategies for self-awareness and self-discovery were almost nonexistent. Closed and fearful—and crippled by writing anxiety and her conception of teacher and student roles—she seemed profoundly disadvantaged as both a learner and future teacher. As my poster child for fakery, Kim personifies the insidious effects of writing’s hidden curriculum. At the root of such pathology, I believe, are adversarial roles for teacher and student. School is seen as a game, and the score is kept with grades. Fakery is valued and personal insight devalued. But it doesn’t have to be that way. Writing to learn was a continual, ongoing activity in Bob’s classes. Kids used drawing and writing to put biology concepts into terms that made personal sense, then shared these notes during small group discussions and labs—in effect, teaching one another through high-engagement activities. Most of them loved learning in this way. Yes, they got points—lots and lots of points—for their participation; but, no, Bob didn’t grade the writing. His aim, in a nutshell, was to make learning a discovery experience. As students made discoveries about biology, Bob made discoveries about how to assist their learning. For example, he pulled questions from their learning logs to focus his follow-up teaching. This dialogue generated additional writing. Bob’s basic strategy was to outsmart his students. Their overarching goal, he knew, was to get him doing all the intellectual work while they doodled on the backs of notebooks. One tried-and-true way to accommodate the student agenda was to first assign biology homework and then—when they didn’t do it—tell kids what they should have learned. So Bob sometimes took a different approach. He let the students interrogate him. And just for the fun of it, he often gave obviously wrong answers. “That isn’t right!” his students would say, scrambling for their books. Bob used writing-to-learn strategies in all kinds of ways—to open class, to explore concepts during class, to summarize learning at the end of class, and to anticipate reading for tomorrow’s class. Students often swapped papers and responded in dialogue fashion to each other’s ideas. All of this written work was ungraded, but points did provide an incentive for staying on task. Each check mark in his grade book was worth a set amount—say, ten points—but Bob would sometimes offer double points for special learning log activities—or even, on rare occasions, triple points. “This is important material,” Bob would reply. As a management strategy, Bob had students keep their spiral-bound learning logs in the classroom, using separate color-coded boxes for each class. At the end of a period, kids didn’t close their notebooks but instead left them folded open to the current day’s work and deposited them in the box. Each log entry had the date and the student’s name at the top. Of course, having the logs already open saved Bob time. He could “check” a stack in minutes. And he could use “sticky notes” to flag entries of special interest, ones he wanted to use as a bridge to follow-up teaching. The logs offered Bob a window on each student’s knowledge construction site. As you may already have guessed, the brighter kids in Bob’s classes were the first to see that points mattered little when everybody had amassed roughly the same total number, all earned through active participation. But by then it was too late since they had already been hooked into the fun of writing to learn. What they had learned about biology truly felt good—and this showed up in end-of-semester assessments. Generally speaking, writing-to-learn activities enabled students to better understand concepts, and this understanding made the material more memorable. But although the anecdotal evidence was compelling, Bob wanted proof that writing was having positive effects on student learning. In an action research study with matched groups of kids, he tested the writing-to-learn method against traditional methods of instruction and found that, as a group, students who wrote regularly learned every bit as much as their control group counterparts—but, in addition, retained what they had learned in delayed posttests of biology content. Bob’s study, published by the National Writing Project, has helped many skeptics see the instructional potential of writing. His work reminds us of the root sense of the word education—”drawing out” student understanding—in contrast with hidden curriculum’s emphasis on “stuffing in” information. With the image of Bob Tierney’s class in mind, let’s now consider some practical writing-to-learn exercises—brief, functional, and usually ungraded. These may occur in students’ response journals or learning logs, but they may also occur as stand-alone activities. Many teachers use writing-to-learn to prompt large-group discussion, with students first sharing their writing with a partner or small group, or as a springboard into more formal writing tasks. Writing-to-learn exercises personalize learning by inviting active knowledge construction. For example, if kids assume the persona of “Dear Abby” or “Dr. Phil” to offer advice on solving a story problem in math, they are usually eager to share their chatty texts with one another. Or if students write a letter from one literary character’s viewpoint—that of Huckleberry Finn’s Jim, for example—that character is certain to come alive. Or if students assume the role of a historical figure—Harry Truman deciding whether to use atomic bombs in 1945—a moral dilemma will be viscerally experienced. Imaginative formats can make writing-to-learn fun. For example, students might keep the diary of a character as they read a novel or play. They might create a book jacket for their “Healthy Lifestyle Guide.” They might do an imagined interview with the author of their marketing text. They might write a scene (or alternative ending) for a political event. They might also do cartoons, prophecies, horoscopes, telegrams, obituaries and epitaphs, rap lyrics, posters, collages and mobiles, editorials, newspaper stories, email interchanges, business memos, or historical “you are there” scenes. But while these alternative writing-to-learn formats may motivate student learning, they also need to be linked to real educational aims. What mental processes do we hope to stimulate and develop? Here are some thinking processes worth attending to as well as a few content area illustrations. Of course, the processes can be adapted across all subject matter areas. Finally, it’s worth remembering that ungraded writing-to-learn activities help students develop fluency in written expression. A central tenet of writing process instruction is that learners make progress in the skills of writing to the extent they use language functionally and purposefully. In other words, to get better at writing, students must write a great deal—probably far more than they now do in many schools. This essay’s headnote—”First we shape our institutions, and then they shape us”—suggests that traditions have great momentum. In education, most of us tend to teach as we have been taught. Thinking outside the box is rare; and rarer still is taking action outside the box. Put another way, the basic structures of secondary schools have long resisted change. Although we now have whiteboards rather than chalkboards, handheld calculators rather than slide rules, and moveable desks rather than desks with wooden runners, such changes are mostly cosmetic. The desks often remain in rows, just as they did in yesteryear. And today’s drill-and-practice software packages, though delivered on sleek high-tech computers, are much like the workbooks used by earlier generations. In general, “old wine in new bottles” seems to sum up the situation. Because of tradition, it seems part of the natural order that all writing deserves a grade. We rationalize, for example, that we don’t want students practicing mistakes. And perhaps because of past experience, we worry that students will simply ignore our ungraded tasks. The possible loss of control may make us shudder. But schools are the way they are because we make them that way. If the desks are in rows rather than a student-friendly U shape, it may be because we doubt our own powers to shape the environment for productive dialogue. And if we refuse to consider ungraded writing-to-learn activities like the ones above, it may be because we’re reluctant to question our own practices or because we doubt our skills in implementing forward-thinking ideas. After all, it takes courage to teach. My hope is that as we forego grading in favor of learning—using frequent writing-to-learn activities as our versatile tool—we’ll discover a powerful antidote to the mind-numbing effects of writing’s hidden curriculum.